I know you’ve heard that before, and it’s completely true…especially when it comes to fitness. If you have been struggling with reaching your health goals, I recommend finding a fitness tribe to help you out. It doesn’t matter if you are rocking a Beachbody program or a Richard Simmons DVD or just enjoy jogging around the block. It’s easier to stick to goals when you have a tribe to back you up! When I think back to my own fitness journey….the one I started nearly four years ago and the one I am still on today…..my fitness tribe is the #1 reason why I have been successful. Regardless of where you are in your fitness journey, there are going to be days you just aren’t going to want to workout….there are days where you want to eat a dozen donuts in one sitting and wash it down with a gallon of Sweet Tea from Chick Fil A. When you are paired up with others with similar goals and doing things like sending sweaty selfies via snapchat or sharing your weekly meal plans, you have more motivation to stick to those healthy activities. There are days where I will log into my challenge group and see that all 30 of my challengers have posted their workout for the day but I still haven’t….do I want to be the only one who didn’t log their workout for the day? Hell No! The accountability pushes me to get past my excuses. 2. Breaks you out of your comfort zone. I had so many reservations about joining a fitness support group online in the beginning…..when you are getting started it can be a little scary! I was so embarrassed I had gotten to such a low point with my health and didn’t want to be the loser in the group, plus I didn’t know ANYONE in the group…..not one person! I used that as an excuse for a little bit, and then I realized that good comes at the end of comfort zones…..so I jumped in. Fitness tribes make you get past the uncomfortable excuses so you get results. Sometimes we need that….I needed that….and I still do. None of us have all of the answers with what will help, and in the beginning it can be challenging when words like “meal plans” and “measurements” and “portions” are being thrown around. I love being connected with people who share their recipes, meal plans, and tips because it helps me come up with new ideas that I can apply to my own routine. So many of the recipes I love and use on a weekly basis have come to me through my fellow fitness tribe members….they are way better than Pinterest! I love love love love LOVE when someone hits a goal and EVERYONE celebrates your success with you. I hate when I look around and see others cut down people who are achieving goals (trust me, it happens all the time) or when I see people giving up on their goals because they feel like a failure. In a fitness community, small victories are celebrated, as well as those monumental victories, too. Small victories add up to those big ones…..and it is nice to have people who are genuinely happy for your success! Plus, celebration and positive energy is contagious! There have been so many days when I wanted to give up. Last year as I struggled with the loss of my dad, I felt like there was no hope for me and that I was going to revert back to old ways. My fitness tribe didn’t give up on me then….they encouraged me and supported me and gave me the hope I needed to know I would be okay. Little things like that make such a difference. Sometimes we just need someone to tell us we CAN do something. Your fitness tribe can be made up of whomever you want….family members, coworkers, neighbors……the important thing is you want people who have similar goals and will hold you accountable….and who aren’t afraid to dish out tough love if you need it. Core de Whattttttttt? Here’s the Info you need to know! We are getting closer and closer to the highly anticipated release of the new home workout program Core de Force, and my excitement is off the charts! Those who follow me on Facebook know that I have been looking forward to this since I learned of it back in July at our annual Coach Summit, and I think it is safe to say many others are as well! This program brings a fresh new perspective to home workouts by combining boxing with kickboxing and Muay Thai…who wouldn’t love that? As a fitness and wellness coach, I am always anxious to try out a new program to see how it works and who it can best assist when it comes to my clients. For those of you who are looking to get a jump start on the holidays or are wanting a new program to shake up your workout routine, here’s a little more info on this program, set to be released on October 31st. Developed in Thailand over a thousand years ago, Muay Thai focuses on uses the entire body as a weapon utilizing close-combat techniques. Rooted in ancient boxing, its purpose was to assist soldiers when they became disarmed using an eight point system: feet, knees, fists, and elbows. In time it developed into a popular sport. Trainers….you get two! Joel Freeman and Jericho McMatthews! Recognize these guys? If you ever gave Les Mills a shot you do! Who should do Core de Force? Everyone!!!! As with the rest of Beachbody’s programs, there is a modifier for the program if you are a beginner, so don’t be afraid of trying it. As you get stronger, you can increase the intensity and speed of your workouts. This is a great program for anyone who likes boxing, wants to tone up (especially in the core), or loves intensity…….I’m raising my hand because we all know I love intense workouts. You can do this! You just have to be willing to start! What kind of meal plan comes with Core de Force? Core de Force follows the portion fix, so my 21 Day Fix, 22 Minute Hardcorps, and Cize graduates will have no issues adjusting to this plan. You won’t get a set of portion containers with the program, but I can help you order them if you need the set or want more! The food plan is very easy to follow, but don’t worry…if you get confused I am here to help you with all of it. Is there any way to try it? YES! There was a sneak peek earlier in the month, but there’s some good news….you can try it out again on October 24th! How? If you are a Beachbody On Demand subscriber, you already have access! If you haven’t tried it, it’s super easy…..Click Here to get your free 30 day trial. On Demand is my best friend….since I am on the go a lot I love having access to all of my workout programs on my iPad, cell phone, or laptop. It’s also the best bang for your buck if you are shoppertunistic like me! Check out my sneak peek at Core de Force here! From a Team Beachbody Coach! If you don’t have one already, I would love to help you! As your coach, I am able to link arms with you virtually and help you from start to finish as you begin this program regardless of where you are located. We can craft meal plans together, establish an accountability plan to keep you on track, even grocery shop and meal prep together if you are close. My support goes far beyond the Core de Force program; as your coach you gain exclusive access to all of my online groups for as long as you need them and me. I can also help you save money on the products you love that can help you on your journey! Interested in this awesome new workout? I would like to invite you to be a part of my exclusive Core de Force test group that will kick off on November 7th! I love test groups because they are a way for me to be right beside my challengers experiencing a program for the first time. I haven’t led one since Master’s Hammer and Chisel released last year….so to say I am ready for this is an understatement. What are the requirements for the test group? -All participants will commit to both the Core de Force program and Shakeology to be in the group. -Each participant will have ME as their coach. If you are working with another coach already, I encourage you to reach out to them so they can plug you into one of their groups. Sorry, no coaches, please. -You will participate in my private online Facebook group and be willing to log your workouts and daily food activity so I can best assist you in achieving the results you want. ***All test group participants will get a special gift from me: Beachbody Energize…my favorite pre workout and one that you most definitely will want while doing Core de Force! I cannot wait to help you get started using this program and look forward to helping you reach your goals. Stop giving into your excuses, stop feeling like you can’t…..this is your chance to make positive changes that can help you in so many ways. BELIEVE YOU CAN BE HEALTHIER AND HAPPIER. I’m here to help you get there. If you are interested in being one of the selected participants in my Core de Force test group, please complete the following form. All participants will be notified by October 30th so you can order all of your tools the minute they go on sale October 31st. I can’t wait for this….and I can’t wait to help you! Do you currently have a coach? If so, what is their name? Rant of the Week: Negative Nancys. It’s 5am, and I need to rant. Honestly, before 10am a lot of things could push me into rant mode….we all know I rely on coffee every morning and that I don’t truly wake up until about 10am. This particular rant has been on my mind for awhile, and while I have ranted briefly about it on social media before, I feel it needs addressed again. 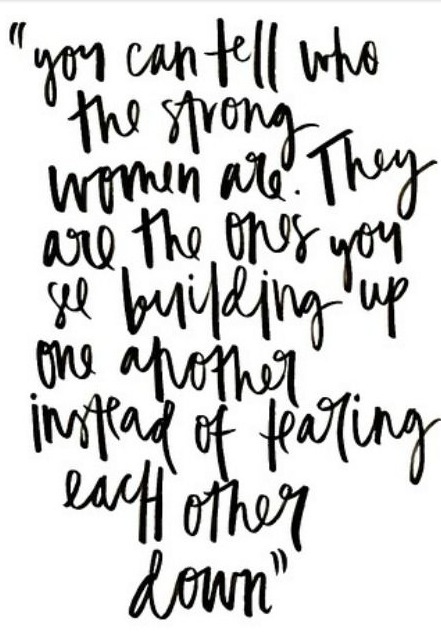 I think often about a quote I read awhile back about how strong women build others up as opposed to tearing them down. It is absolutely true. In my industry I have been very lucky to meet so many women (and men) that are uplifting, kind, and supportive. If I ever need a self esteem boost or pep talk, I know I could go to any one of them and feel rejuvenated within seconds. It is a really great feeling to have a solid support system of people who truly want you to succeed. Why are there not more people doing that? Encouraging, supporting, cheering on others? The constant cutting down, especially on social media, is like a silent hate crime, and it makes me incredibly sad. This morning I had to get up early to take Kyle to the bus station for a fun guys’ weekend away, so I was able to knock out my workout and some office tasks early. The first thing I saw when I signed onto Facebook was someone posting about a particular product that she was very excited to try and several people jumping all over her for trying it. It made me feel so bad for her because you could see in her response the negativity deflated the excitement. I think back to when I was beginning my health journey all the time…I can’t believe that the end of this month marks 2 years since I was at the awful, sad, scared, uncomfortable, embarrassed stage of my life! While I was uncertain about so many things back then, the two things I did know were 1) I needed to find something that worked for me and my life and 2) That I needed a supportive community to help me. I was lucky enough to find both, which ultimately led me to losing 60 pounds and starting a career that really means the world to me. I hate to think what would’ve happened if some negative nancy started riding me about my decisions back then. Please laser focus in on one point I just made. I needed to find something that worked for me and my life. Clearly I am over the moon about the products and programs I have used with Beachbody because they have completely changed my life. THAT IS ME. I know some things may not appeal to everyone, but that doesn’t mean I am going to stop supporting you if you do think that a wrap or weight loss supplement is the way to go. Yes, I would love to be able to help absolutely everyone on the planet feel better about themselves, but part of doing that means you are supportive. I could keep going on and on and on, but I am going to close with this…..this is not Mean Girls. No one should sit around behind their computer and try to cut people down for trying to find a way to get their life going in a healthier direction. Let people try things and figure out what works for them. Everyone is wearing their own pair of shoes, and unless you can find a way to magically walk a day in their lives, stop telling people that what they are doing is stupid or a waste of time. You may believe in yourself and your abilities, but not everyone is so lucky. Some individuals really need the encouragement and support to know they can do it…..be the person who builds them up instead of cutting them down. It can make all the difference in someone’s life. If you are reading this and you are one of those people who have been negative nancied, ignore the comments and nastiness and know that you can do absolutely anything as long as you want to succeed. If you need me to pep talk you every morning, it can be arranged. And sometimes you just have to know when to say #byefelicia to negative nancys in your life.